We have the facilities and experience to contribute to the success of your function, whether it be a business meeting, a dinner party, or a large party. 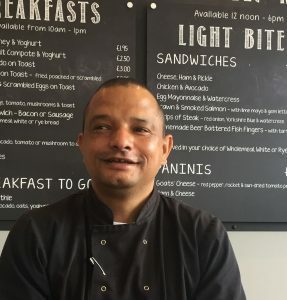 We’re pleased to have our very own specialist chef, Elton Carelse, who has more than 25 years of experience. Elton started his life and career in South Africa, working at Café Paradiso and Robben Island in Cape Town. He then moved on to Princess Cruises, travelling the World and serving the rich and famous, working his way from 3rd to 1st Cook. Sticking with his love of the waves, he then moved to the exclusive 5* Sea Dream Yacht Club as Senior Chef de Partie. This is where he met his wife, so they gave up their life at Sea to settle down in the UK. Elton then worked along with his wife at our well known local ice-cream parlour, Billy Bobs as Senior Sous Chef. In his time in the UK, he’s also worked for Carluccios, Harrogate as Head Chef, and as a Roaming Head Chef at the Devonshire Fell and Pickles Pub Group. We’re delighted that he has decided to join us here at ILTSC Café Bar and we wish him a long and happy career with us.